Nothing beats spending a hot summer day in the pool. The cool water alone makes a your pool the biggest draw in your yard on a hot day. Having a pool is great, but it’s even better when it adds aesthetic appeal to your property and improves your outdoor living space. 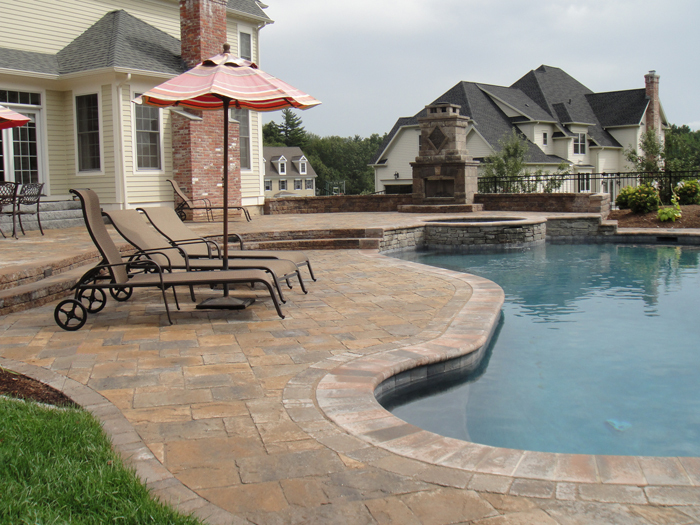 Here are some ways to spice up your pool area this summer to make it even better! Do you wish you could use your pool later on in the day and into the night? Adding lighting to your pool itself in the area can be a great option. 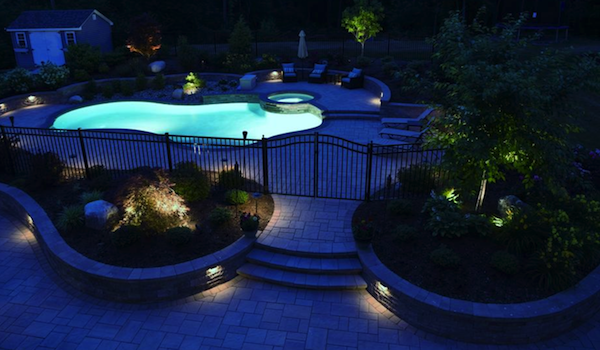 When it starts to get dark, lighting will improve safety so that you can enjoy your pool area worry-free. It can also create an inviting atmosphere that will make your pool area the place to be on summer nights. What’s better than a pool? A hot tub/pool combo! Adding a hot tub to your pool area can improve the overall look and create a great spot to relax. After getting some exercise swimming around in the pool, you can relax your muscles in the hot tub. It will create a great way to spend time in your pool area on cooler nights and give people who aren’t big swimmers a place to hang out. Adding a fountain or waterfall to your pool area is a great way to add aesthetic interest to the area. You have a lot of options when it comes to water features, from waterfalls that flow into your pool to decorative fountains that add appeal to the area. Whatever type of water feature you choose, it’s sure to improve the area’s aesthetic and wow your guests. Not everyone wants to spend hours in the pool, but no one wants to be excluded from the fun! Creating a comfortable place for yourself and guests to spend time in the pool area will ensure that your pool area becomes a place to spend the day, rather than just a place to swim. Outdoor seating is a great way to make your pool area a living space that everyone can enjoy. Adding a patio around your pool is a great way to transform your pool area from a swimming space to an outdoor living space. A walkway connecting your pool area to your home will ensure safe navigation around your property and make your pool area feel more inviting. Patios and walkways are a great way to add functionality and aesthetic to an outdoor living space. If your pool area is visible to neighbors or from the street, a privacy screen is a good idea. Not only will it allow you privacy while you enjoy your pool, but it will make your pool area feel like its own space. With a privacy screen, you won’t feel on display while you enjoy your pool, and you’ll feel like you’re hosting your own private party. Not only do privacy screens provide a sense of security, but they can be very attractive and add aesthetic appeal to your property. Clarke Landscapes LLC is a full service landscape contractor. Owner Mather Clarke has over twenty years of experience in the professional landscaping arena and is dedicated to innovative designs and quality installations. We service all of central Connecticut and work closely with our customers to design, build and create great landscapes for them to enjoy for years to come! Combining a great staff with extensive resources and quality materials, we are fully equipped to handle any landscaping project.